Enterobacter sakazakii is a foodborne pathogen that has been associated with sporadic cases and outbreaks causing meningitis, necrotizing enterocolitis and sepsis especially in neonates. The current FDA detection method includes two enrichment steps, the subculturing of the second enrichment broth on a selective agar (VRBG), a further subculturing of selected grown colonies on TSA and the subsequent biochemical identification of yellow-pigmented colonies by API20E. However, there is a strong need for simplified methods for isolation and identification of E. sakazakii. In this study, two chromogenic media, which allow to indicate presumptive E. sakazakii colonies by the alpha glucosidase activity, as well as a newly developed 1,6-alpha-glucosidase based conventional PCR assay and a rRNA oligonucleotide probe based commercial test system for identification of presumptive E. sakazakii were evaluated on 98 target and non-target strains. The methods were compared with respect to specificity aspects. A total of 75 presumptive E. sakazakii and 23 non-target strains were analysed by using chromogenic media, alpha-glucosidase based PCR assay, and the VIT assay. For most presumptive E. sakazakii strains on the chromogenic media, the PCR and VIT assay confirmed the identification. However, for a number of presumptive E. sakazakii isolates from fruit powder, the alpha-glucosidase PCR and VIT assay did not correspond to the typical E. sakazakii colonies on DFI and ESIA. Further characterization by API32E identification, phylogenetic analysis of partial 16S rRNA sequences and ribotyping strongly suggested, that these strains did not belong to the species E. sakazakii. The newly developed alpha-glucosidase based PCR assay as well as the commercially available VIT Enterobacter sakazakii identification test showed an excellent correlation with the 16S rRNA data, and are thus well suited for identification of E. sakazakii. The results indicate that presumptive colonies on ESIA and DFI media need further species identification. Both evaluated molecular methods, the alpha-glucosidase PCR and the 16S RNA in situ hybridisation test (VIT), although based on completely different target regions and methodologies performed equally well in terms of specificity. E. sakazakii is a motile, non-spore forming, Gram negative facultative anaerobe microorganism. It was previously referred to as "yellow-pigmented Enterobacter cloacae" until it was designated a unique species by Farmer et al. . The organism is an occasional contaminant of powdered infant formula milk that can cause a rare, but life threatening form of neonatal meningitis and necrotizing enterocolitis, which is the most common gastrointestinal emergency in the newborn [2, 3]. The current Food and Drug Administration (FDA) method for detection of E. sakazakii includes a pre-enrichment procedure in buffered peptone water (BPW), enrichment in Enterobacteriaceae enrichment (EE) broth, plating on violet red bile glucose agar (VRBG) and picking of five grown colonies onto tryptone soy agar (TSA) plates, which are incubated at 25°C for 48–72 hours. Yellow-pigmented colonies, typical for E. sakazakii, on the TSA plates are confirmed using the API20E system. However, there is a strong need for simplified methods for isolation and identification of E. sakazakii. Guillaume et al. published a new procedure, based on selective enrichment in modified lauryl sulfate tryptone broth, by addition of 0.5 M NaCl. Additionally, there is a strong need for good identification methods for presumptive E. sakazakii isolates. A feature, which can be used for this is the α-glucosidase activity, which was demonstrated to be present in all E. sakazakii strains and not in most other members of the Enterobacteriaceae . Based on this biochemical property several differential media were developed recently [6–9]. Two of these media the Oxoid Chromogenic Enterobacter sakazakii Agar (Oxoid CM1055, Oxoid, UK) – also known as the Druggan-Forsythe-Iversen (DFI) formulation  – and Enterobacter sakazakii Isolation Agar (ESIA, AES, France), are commercially available and were included in our comparative study. In a recent study, the molecular basis of the α-glucosidase activity in E. sakazakii was determined . An open reading frame containing a sequence potentially coding for a 1,6-α-glucosidase was identified. In the current study, the potential of a PCR system based on the 1,6-α-glucosidase for the specific identification of E. sakazakii was evaluated on the DNA of target and non-target strains. The VIT (vermicon identification technology) represents a commercially available detection and identification system based on fluorescently labelled gene probes targeting specified regions on the ribosomal RNA of the bacteria. Subsequent to analysis, the illuminated E. sakazakii cells are visualised under an epifluorescence microscope. The current study represents a comparison of two commercial chromogenic media, which indicate presumptive E. sakazakii colonies, as well as an evaluation of an α-glucosidase based PCR assay and a rRNA targeting in situ technique for the rapid identification of E. sakazakii. Ninety-eight target and non-target strains were included in the study and results were compared for specificity and convenience in performance. The results of the target and non-target strains included in this study for the comparison of the DFI and the ESIA media are summarized in table 1 and 2 in view of producing presumptive, typical colonies for E. sakazakii. Generally, the results for the 63 E. sakazakii strains were in good concordance, blue-green coloured colonies on DFI agar and turquoise on ESIA media, except for one E. sakazakii strain (FSM 322), which gave grey-white colonies on DFI agar (Figure 1A) and thus was considered negative on this medium. Furthermore, of the 23 non-target strains (Table 1), one S. ficaria environmental isolate showed the typical blue-green colour when grown on DFI agar, but was correctly identified as negative on ESIA medium (Figure 1B). Target and non-target strains used in this study and results obtained with the chromogenic media DFI and ESIA, the α-glucosidase based PCR assay and the rRNA probe based VIT test. Colonies on ESIA and DFI media, growth in mLST broth and results of the two molecular identification methods for the 12 non-E.sakazakii fruit powder isolates investigated in this study. Atypical colonies of E. sakazakii FSM 322 (A) and typical colonies of S. ficaria (B) on DFI agar. However, within a set of 12 strains, originally isolated from fruit powder (Table 2), typical blue green and turquoise colonies, respectively were observed for 8 strains on ESIA and for 11 isolates on DFI medium, when incubated at the recommended temperature. An example of the fruit powder isolate 1160/04 grown on DFI and ESIA medium is given in Figure 2A and 2B. API32E analysis on these strains revealed ambiguous results, but none of the strains were identified as E. sakazakii. According to the literature P. shigelloides, E. vulneris, C. koseri or Pantoea sp. can give typical coloured colonies on DFI agar . API32E identification suggested as identification E. vulneris and Pantoea spp. as well as Buttiauxiella agrestis [ 11], which was previously known as Citrobacter group F, for several isolates within this group, although with low levels of confidence. However, the two reference strains E. vulneris ATCC 33821 and P. agglomerans ATCC 27155, included in this study were correctly identified as negative by both selective media (Table 1). Non-E. sakazakii fruit powder isolate 1160/04 grown as typical colonies on ESIA (A) and DFI (B) media. In order to obtain more information on the fruit powder strains partial sequencing of the 16S rRNA gene was performed. Affiliation to the phylogenetic tree revealed, that all isolates were clearly distinct from E. sakazakii sequences from both lineages . In Figure 3 and 4 the phylogenetic tree (Figure 3) and the respective distances matrix (Figure 4) of these strains with respect to E. sakazakii strains from both lineages and other selected members of the Enterobacteriaceae are given. 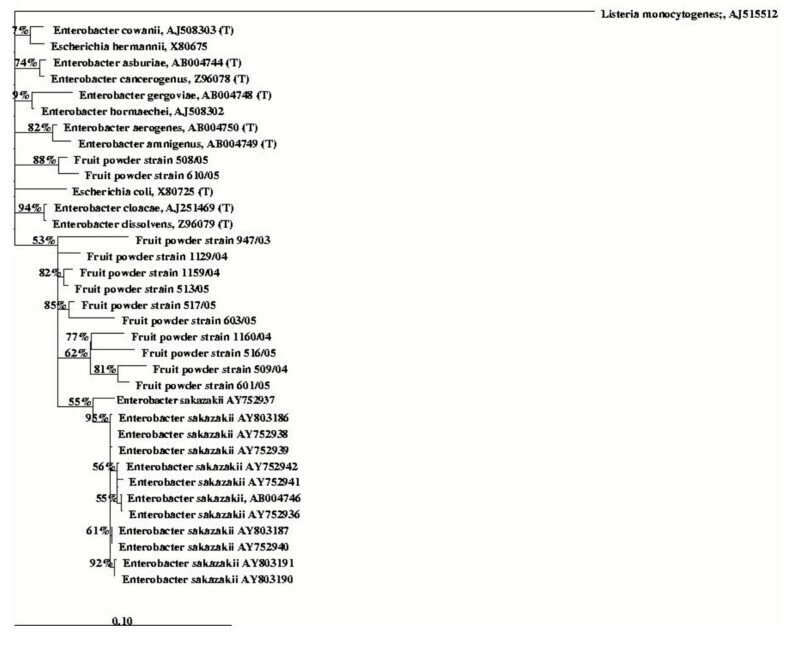 Sequence similarities of 96 – 97% to type strains of other members of the Enterobacteriacaeae suggested that the organisms were members of the same genus but none of the isolates exhibited sequence similarities > 97% to E. sakazakii sequences from both lineages (Figure 4). Finally, ribotyping was performed on nine of the questionable strains again revealing, that the strains are not belonging to the E. sakazakii group (data not shown). Phylogenetic tree comprising the partial 16S rRNA gene sequences of twelve non-E. sakazakii fruit powder isolates investigated in this study in comparison to a selection of previously sequenced E. sakazakii strains as well as other selected members of the genus Enterobacteriaceae. Respective distances matrix calculated with the sequences from figure 3. Additionally, growth experiments were performed for the strains of interest using a recently developed selective enrichment for E. sakazakii detection in environmental samples . Experiments were performed in lauryl sulfate tryptose broth (mLST) supplemented with 0.5 M NaCl and 10 mg/liter vacomycin with or without an included non-selective enrichment step in BPW starting with BHI grown cultures. All strains were unable to grow within mLST broth at 44°C, regardless including a non-selective enrichment step in BPW or not (Table 2). In the study recently published by Guillaume-Gentil et al. , all of the E. sakazakii strains (n = 99) tested, were able to grow in mLST at 45°C, whereas 35 of 39 strains of potential competitors, all belonging to the Enterobacteriaceae, were suppressed. They concluded, that the inclusion of this enrichment broth could be very useful for the reliable detection of E. sakazakii in environmental samples. In our study, however, E. sakazakii strain FSM 322 could also not grow in mLST. Applying the α-glucosidase based PCR system we were able to identify all target strains. No false positive result was obtained within the group of non-target strains. An example of the identification of a fruit powder strain by PCR assay is given in Figure 5A. It is worth mentioning that both compared selective media are based on the proposed α-glucosidase activity of E. sakazakii. From literature it is known, that several other organisms also exhibit this biochemical feature and can grown on DFI . The α-glucosidase based PCR system, however, exclusively targets the gene responsible for the α-glucosidase activity in E. sakazakii. By using the VIT test, all of the E. sakazakii strains were identified. No false positive result was obtained within the group of non-target strains. These results were in good concordance with those obtained with the α-glucosidase based PCR system. The target strains were easy to identify due to the specific red colour under the epifluorescence microscope. In Figure 5B, an example of a positive identification of E. sakazakii fruit powder strain1160/04 by VIT is given. However, during analysis of the strains used in the study, some autofluorescence was observed in several samples of the non-target strains. Inclusion of a positive reference strain during analysis can overcome this problem, since a "true signal" differs significantly in brightness. The major advantage of this easy to handle molecular method is represented by the fact, that the bacterial rRNA is targeted by the probes, thus in principle only vital E. sakazakii cells containing an efficiently high ribosomal content are detected by the assay. Results are obtained within three hours and the performance of the test is not restricted to an especially equipped laboratory. Detection is possible to the single cell level, even in mixed material containing target and non-target cells. The detection limit of the assay was experimentally determined using serial dilutions of overnight cultures of two different E. sakazakii reference strains (ATCC29544, ATCC51329) and determination of the cfu/ml by quantitative plating. A detection limit of 103 cfu/ml was ascertained for both strains. By comparing the two chromogenic media on a set of 98 target and non-target strains, the ESIA medium proved to be more indicative for presumptive E. sakazakii colonies. Inclusion of an enrichment step in mLST can reduce the number of presumptive colonies, with are not E. sakazakii. Nevertheless, all presumptive colonies on ESIA and DFI media need a further species identification. The two molecular methods, although based on completely different target regions and methodologies performed equally well in identifying E. sakazakii strains. Both methods showed 100% specificity. The PCR based system needs a DNA extraction step, prior to amplification set up, but is easily implemented into PCR adapted laboratories. The VIT test represented a fast and convenient to handle test system. 63 E. sakazakii strains from human, food, cosmetics and environmental origin including three reference strains were used in the study (Table 1). A first set of 39 strains belonging to different species other than E. sakazakii represented a part of the non-target group (Table 1). Moreover, another 12 strains were added to this non-target group (table 2). They were isolated from fruit powder using the FDA approach. All of these strains have shown typical colonies on ESIA and/or DFI agar and were shown by API32E to be non-E. sakazakii. However, it was not possible to reliable identify theses strains by API32E. In order to do this, 16S rRNA gene sequencing and phylogenetic analysis of these fruit powder strains was done. For PCR amplification of the 16S rRNA gene, DNA was extracted from 1 ml cultures grown in BHI broth for 24 hours at 37°C using the DNeasy Tissue Kit (Qiagen AG, Switzerland) in accordance with the protocol of the supplier. Partial sequencing of the 16S rRNA genes of these strains was performed according to the method recently published by Lehner et al. . The same primers were used for amplification and sequencing of the 16S rRNA gene, except that no internal walking primers were employed. The partial 16S rRNA gene sequences of the 12 strains were added to an alignment of 28.000 almost full length small subunit rRNA sequences by using the alignment tool of the ARB program package. Phylogenetic analyses were performed using distance matrix and the TREEPUZZLE tool included in the ARB software package employing special data structures (PT-servers) derived from the ssu-rRNA database „ssu_jan04.arb. Additionally, ribotyping was performed on nine selected fruit powder strains (1159/04, 947/03, 1129/04, 517/05, 610/05, 1160/04, 513/05, 509/05, 508/05) on a DuPont RiboPrinter Microbial Characterization System TM according to the method described by Bruce . Furthermore, growth of the fruit powder strains in lauryl sulfate tryprose broth supplemented with 0.5 M NaCl and 10 mg / liter vancomycin (mLST) for 22 – 24 h at 44 ± 0.5°C  was examined in two different manners: i) inoculating 10 ml of mLST broth with 10 – 100 cfu of a BHI grown culture (overnight, 37°C), ii) inoculating 25 ml of buffered peptone water (BPW) (37°C for 16 – 20 h) with 10 – 100 cfu of a BHI grown culture (overnight, 37°C). Thereafter 10 ml of the mLST broth were inoculated with 0.1 ml of the BPW grown culture and incubated as described above. The strains were streaked onto DFI agar plates (Oxoid, UK) and ESIA agar plates (AES, France) and incubated at 37°C (DFI) and 44°C (ESIA) for 24 h. Colonies that were entirely blue-green on DFI and turquoise on ESIA media after 24 h incubation were indicative for presumptive E. sakazakii colonies. According to the suppliers protocol purple colonies on ESIA media and non-blue green colonies on DFI agar were considered non typical. Within a recent study two open reading frames were identified both coding for enzymes with the potential to hydrolyze the fluorescent substrate 4-methylumbellyferryl-α-D-glucoside . The primers that were used for subcloning in that study were modified in the current study and the optimal annealing temperature was determined. The following primers were applied for specific amplification of the gene putatively encoding the α-glucosidase activity: EsAgf: 5'- TGA AAG CAA TCG ACA AGA AG-3'and EsAgr: 5'- ACT CAT TAC CCC TCC TGA TG-3' generating a product of 1680 bp in size (GenBank accession number AM075208). The PCR reactions were set up in a total volume of 50 μl. The reaction mixture contained 5 pmol primers each, 100 μM dNTPs each, 1× Taq polymerase buffer and 2 U Taq polymerase (Promega). Thermal cycling was carried out by using an initial denaturation step at 94°C for 2 min, followed by 29 cycles of denaturation at 94°C for 30 sec, annealing at 58 °C for 60 sec and extension at 72°C for 90 sec. Cycling was completed by a final elongation step at 72°C for 5 min. The amplification products were analysed by gel electrophoresis and ethidium bromide staining. The VIT Enterobacter sakazakii test (vermicon, Munich, Germany) was performed according to the instructions of the manufacturer. For analysis, 1 ml of BHI grown cultures (overnight, 37°C) were used. AL carried out the PCR experiments, the phylogenetic analyses and drafted the manuscript. SN participated in the PCR experiments and carried out the cultural and VIT experiments. PB and BD performed ribotyping and participated in the cultural experiments. KT carried out the 16S rRNA gene sequencing. RS conceived of the study, participated in its design and coordination and helped to draft the manuscript. All authors read and approved the final manuscript.